We use globally prized maple water as our "water" base, blended with high quality botanical ingredients in the form of five types of plant stem cells, and completely safe, high performance bio ingredients. 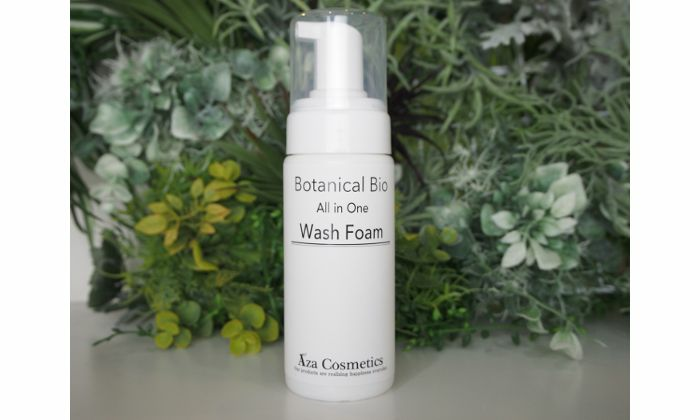 This plant-derived amino acid foam is gentle on the skin and can also cleanly remove makeup. An all-in-one foam wash which combines a makeup remover and a facial cleanser. With dry hands and face, pump into your hand three to four times, then blend the product into your makeup using a massaging motion. When the makeup has loosened, wash thoroughly with cold or lukewarm water. Please note: waterproof UV creams and foundations can be cleanly removed, but please use a specialized makeup remover for such products as waterproof eyeliner and mascara. Aza Cosmetics was founded as a general beauty manufacturer to lead a new era. In tireless pursuit of health and beauty, we research and develop professional products with a focus on high functionality and an insistence on high quality, peace of mind, and safety. By combining organics, our specialty natural ingredients, additive free products, and the power of modern bio science, we bring a smile to our customers' faces. This foaming cleanser can remove basic makeup such as sunscreen , makeup base , foundation . I think it is a nice product . So surprised because this All In One Wash Foam can remove makeup.The foam is soft and won't dry out my skin!Like it. As I have dry skin type, I think this product slightly too dry for my skin. But I agree that it is a convenient product to clean your face. Very convenience product to get bubble easily. A little bit dry for dried skin. It is still good to use in summer, but not recommend in winter for dried skin type. It is easy to use. it can easily to get the bubble without use your hands. It also not to dry after wash the face.